One way to freshen up your look this year is with a new designer handbag from Macy’s! They have a great selection so you can choose the ones that pop with your sense of style. 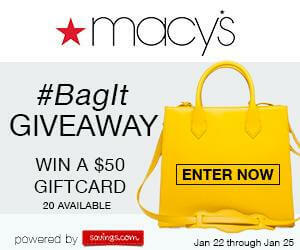 We’re making it even better by giving you the chance to win one of twenty (20) $50.00 Macy’s gift cards that you could use to purchase your designer handbag.